Learn to “throw” on the Potter’s Wheel. Taught by a Master Potter with 20 years experience as a full time Production Thrower, and over 40 years as a Potter. The full cost of this course is $1200. 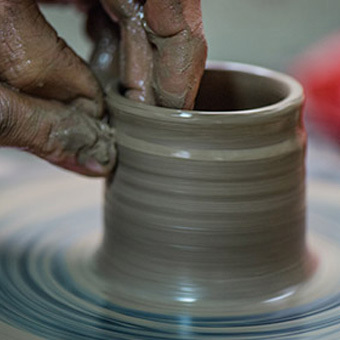 To be eligible for the FREE potters wheel students should book and pay online. Your booking will be confirmed and a brand new Firebird Studios Compact Potters Wheel will be ready for you to take home after your first class! Our wheels are lightweight, easy to carry and they fit in small spaces! Course fees include all clay (plus a free bag to take home with you) – we will be using primarily Walkers #10 fine white stoneware clay. The clay will often times be recycled clay. On the whole you will only keep a small percentage of the work you do, as practice is all about cutting things in half! The work you keep can be fired if you choose – the colourant and firing cost is $7 per kg of finished work. Decorating and glazing your work will not be done as part of the course. We highly recommend that students taking this course also participate in Open Studio Classes where you can finish, decorate and glaze your work! Book Here for May 22nd Start. Keep one bowl and one cylinder for trimming next week. Well done! You have probably learned more in 16 weeks than many have done over years of pottery self development and other classes. You are well and truly ready to go into Open Studio classes where you can follow your passion and interests. Firebird studios teachers will help you to continue your study and development every step of the way!